Like most things in life the past few years, I somewhat stumbled upon my circuit routine early in 2012. I had just returned to running and racing after nearly 2½ years away from the sport. A few years earlier, too many miles and too little respect for my body found myself injured and doubting I’d ever even run a gentleman’s pace with friends again, let alone train and race competitively. I was determined to approach this unexpected gift with a new philosophy and greater respect for the demands of competitive training and racing, and equally important, to better balance running within my life with my partner Christina. After debating the costs of a gym membership with my housemate at the time, we grabbed what we had laying around the house and scraped together our first circuit routine. Through trial and error the routine has evolved into a year round staple of my training and has affectionately been nicknamed The Equalizer. I believe strongly that this twice a week routine has helped me build the strength, stability, and flexibility I need to stay fit and healthy and perform my best over the long miles of training and racing. Juggling training, a full-time job, and all of life’s other obligations can be challenging at times and it’s great to have a routine I can complete at home in 30-40 minutes, without the added cost and inconvenience of traveling to a gym. Two sets of 10-15 exercises, 1-minute per exercise with 15-seconds rest between each. Perform as many repeats as possible within each minute while always being conscious of maintaining proper form. Battle rope – High intensity anaerobic conditioning that may send you to exhaustion well before the minute is up. Medicine ball throw – Explosive full body exercise that will quickly have your heart racing to keep up. Indo board balance – Balance is an underappreciated tool for performing your best on the trails. An Indo board is great for core conditioning and strengthening smaller and often overlooked stability muscles. 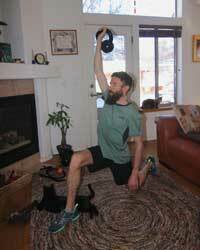 Turkish Get-up – A highly functional movement requiring full body coordination. If I had to choose only a single exercise to perform the rest of my life, this would be it. Speed skater – Whole body plyometric – strength, stability, flexibility and agility wrapped neatly into one exercise. Wow! That’s a lot to explore! Thank you. Rob, thanks for the details and congrats on the Sanoma 50. Thanks so much for sharing. Need to give that routine a try. Thank you for sharing! This is extremely helpful.